After you have refined some products, you can now sell them. Be sure to sell your products when their market value is above the breakeven value, so you can make profit. The higher it is above breakeven, the more total profit you will make. 1. Month: The current month you are in. You start the game on the current month according to your computer clock. The number in parenthesis next to the month is the turn number you are currently on. The game lasts for 120 turns. 2. Cash: This is the amount of cash you currently have available to you for purchases. 3. Market Price of Products: The current worth per gallon of the specified product. Selling prices can fluctuate even more rapidly than refining costs. You should make sure that the this is always above the breakeven before you sell; otherwise, you will lose net worth. 4. Breakeven: The breakeven for the specified product. Breakeven is the price that the market price must reach in order to pay back the costs to get the product. If the market value is above the breakeven, selling the product will pay for the cost of getting it, and you will end up with some profit. If the market value is below the breakeven, you will not have enough to pay for the costs it took to get the product, so selling the product will result in a small loss in net worth. 5. Storage Units: The number of storage units you currently own. Each storage unit can store up to 15,000,000 gallons of crude or products. For information on renting storage and crude reposession, click here. 6. Storage Available: The amount of storage you have available for additional crude. This is equal to the number of storage units times 15,000,000 minus any crude or products you already own. 7. Products to Sell: The total number of gallons of products you shipped out to sell this turn. This includes all your products. 8. Products in Stock: The total number of gallons of each product that you currently have in stock. 9: Sell Product button: Click these buttons to sell the specified product. See Selling below. 10. Close button: Closes the current screen and returns you to the main menu. 11. Toggle Main Menu button: Opens the main menu without closing the current screen. If the main menu is already shown, clicking this button will hide the main menu. 12. Sell Products Graph: Displays the trend in selling prices over the past 12 months. The light green line indicates the selling price of lubricants, the blue line for gasoline, the white line for fuel oil, the tan line for oil products, and the light red line for kerosene. To highlight a particular line, click on legend display on the right for the line you wish to highlight. To hide a line, right-click the legend display for the line you wish to hide. Before selling any products, you must refine some crude oil and advance the turn. Once the products are in your inventory, you can sell them at any time. Make sure the market price is above the breakeven for the product you want to sell, so you can make some profit. To begin selling the product, click the Sell button for the product. The graph will be replaced by a place where you can enter the number of gallons you wish to sell (shown below). Type in the amount and click OK. The product will be shipped immediately, but you will not get the cash from the sale until the next turn. 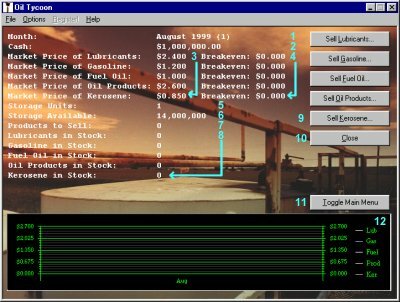 Copyright � 2000 Rocky Mountain Systems, Inc.
For information regarding Oil Tycoon!, please contact Jeffrey Korringa. For questions, comments, or suggestions about this web site, please contact Kyle Sampson.